I’ve been emphasizing that the U.S. Federal Reserve has not been printing money in the conventional sense of creating new dollar bills that have ended up in anybody’s wallets. Instead, the Fed has been creating new reserves by crediting the accounts that banks maintain with the Fed. Today I’d like to offer some further observations on how those reserve balances mattered for the economy historically, how they matter in the current setting, and how they may matter in the future. When the Fed makes a purchase of, for example, U.S. Treasury bonds, it does so by simply crediting an account that the selling institution maintains with the Fed, creating new funds out of thin air. The selling bank surrendered T-bonds which the Fed now owns, and has command of new reserve deposits, with which it can do anything it likes. For example, the bank could use the funds to buy some other asset, by instructing the Fed to transfer its balance to those of the bank from which it wants to buy the asset. Alternatively, the bank could use the reserve deposits to make a loan, pay another bank for funds owed, withdraw them by asking for cash from the Fed, or simply hold on to the reserve deposits. Reserve deposits are an asset like any other, and if a bank makes a conscious decision to hold on to them, it is because it regards this asset as at least as attractive as any alternative use it might make of the funds. Equilibrium requires that the supply created by the Fed equals the quantity banks desire to hold. Before 2008, the primary demand for reserves came from the fact that the Fed required banks to hold certain levels of reserves. The banking system as a whole held a little more than required, because many individual banks wanted to avoid penalties or extra costs that might result if some last-minute withdrawals caused the bank to lose its reserves at a late hour in the day when it would be hard for the bank to borrow funds to replace them. 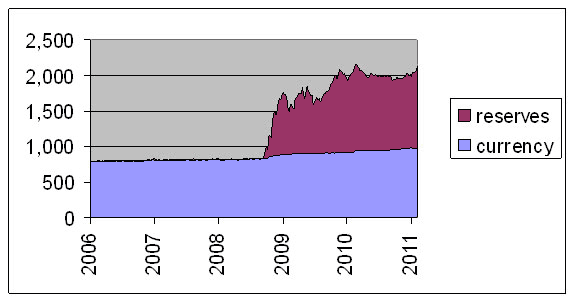 The fed funds rate, which is the interest rate banks charge each other for an overnight loan of reserves, was very sensitive to the level of excess reserves in the system, and gave the Fed a credible tool for maintaining a desired target for the fed funds rate by adding small amounts of reserves with T-bill purchases, or removing small amounts with T-bill sales. To understand how that equilibrium worked, consider an individual bank that initially had what it thought was the right level of reserves for its own needs. Suppose a customer of the bank unexpectedly deposits a check drawn on another bank, which that bank honors by instructing the Fed to send its reserves over to the receiving bank. The receiving bank now has a much larger reserve balance than it needed. It would therefore try to find some other use of the funds, for example, by buying an asset or lending the funds to another bank, rather than leave them idle at the end of the day. The sending bank would likewise find itself short, and likely either sell some assets or borrow reserves on the fed funds market, perhaps ultimately borrowing the reserves back from the receiving bank. The result was that reserve balances were passed back and forth between banks many times each day, with each receiving bank almost always finding something better to do with the funds than just hang on to them overnight. One can get a sense of the scope of this by looking at the volume of transactions on Fedwire, the system a bank uses when it wants to instruct the Fed to debit its account with the Fed and credit the account of the bank to which it wants to make a payment. For example, on an average day in 2006:Q1, about $2.2 trillion in reserve deposits were sent between banks over Fedwire, despite the fact that reserve balances only averaged $13 billion each day. In other words, each dollar of reserve deposits was trading hands something like 2,200/13 = 170 times each day before finally ending up being held by somebody when the books were closed for the day. 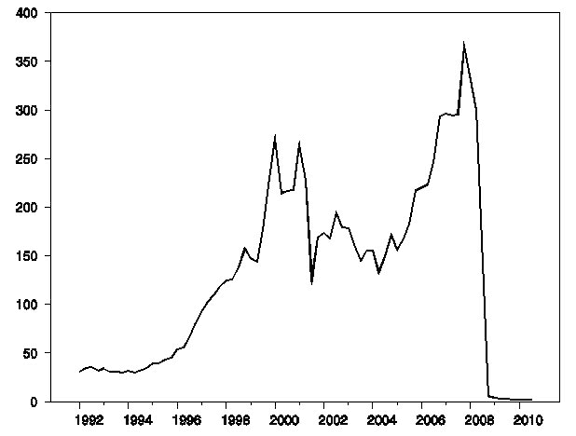 The graph below plots this concept of “velocity of reserve deposits” for the last two decades. Ratio of (1) average daily value of transactions on Fedwire (from Federal Reserve Board) to (2) average daily value of reserve balances with Federal Reserve Banks (from Federal Reserve Bank of St. Louis), 1992:Q1 to 2010:Q3. One can also see from the figure how radically differently the system is functioning today. In 2010:Q3, about $2.4 trillion was transferred each day on Fedwire. Compared to over a trillion dollars in reserves outstanding, that implies a velocity of 2.3. In the current setting, a given dollar of reserves is transferred about twice from one bank to another, and then as likely as not just sits there for the rest of the day. A key reason that the system functions so differently today is that banks really don’t see much better use for the funds than just holding on to them as reserves. A bank gets paid 0.25% annual interest for maintaining the reserve balances with the Fed, which is actually substantially better than you’d get from buying a 1-month T-bill. Many banks are still afraid to make any but the very safest of loans. In such a setting, the Fed could create all the reserves it wants, and it’s not clear that much if anything has to change as a result. However, the situation is not going to stay like this forever. When banks do start to see something better to do with their funds, one could imagine the situation changing pretty quickly. The Fed’s plan when that starts to happen is to remove some of those reserves by selling off some its assets, and preserve the incentive for holding reserves by raising the interest rate paid on them. But a recent note by economists Huberto Ennis and Alexander Wolman of the Federal Reserve Bank of Richmond observes that negotiating the details of that transition could prove tricky in practice. Put a trillion dollars in reserves together with a velocity in the tens or hundreds, and pretty soon you’re talking about real money.